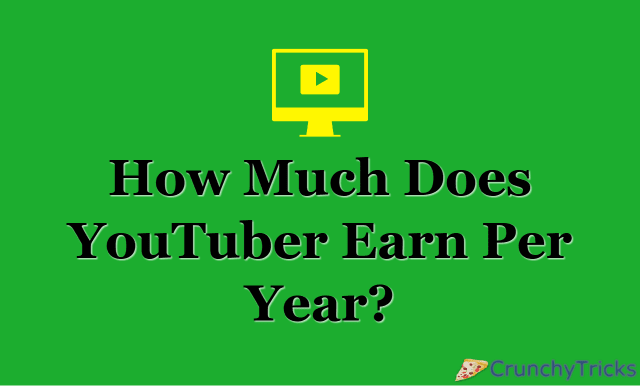 How Much Does YouTuber Earn Per Year? YouTube is leading the way in the content marketing being the leading platform for video sharing, video marketing, video blogging or vlogging, as it is called. So many people want to quit their jobs to become a full-time YouTuber as this seems natural and better option to earn more money. You get paid for what you love, what more you want? People think it's the best way to grab Fame and Fortune but reality is contradictory. To calculate how much do a regular YouTuber make per year, let’s have a look at how this works. How do you earn on YouTube? YouTube would pay you only if it makes through your videos. It is possible with the help of valid clicks or views of ads that come at the bottom of your video. There are some algorithms used to verify whether the click is valid which excludes the count if the click on an ad is from same IP address. The view of the ad is counted only if the ad is seen for at least 30 seconds or half of the ad (whichever happens first). Ad agencies pay you money based on ad count. Out of which, YouTube keeps 45 % of ad revenue. However, there are some steps to get to this point where ad agencies pay you. What are the steps to getting paid on YouTube? The key ingredients for a successful YouTube channel are a loyal, engaged community and a steady stream of great and exciting videos. For earning money on YouTube, it is crucial to have an audience that loves to watch you and your work. One important thing that you must remember is that you should consistently upload videos. People subscribe your channel because they want to see more of your job. Once you have 1000 subscribers, the next step should be to enable your channel for monetization and then to link it with your AdSense account to earn money. After linking your account, for every monetized ad count, you make money. Is there any other way to earn other than through Ads? The making of money is not limited to ads. However, they do play a tremendous part of the money you make. YouTube Red Subscription: - YouTube Red is a paid membership that lets users enjoy your video without ads. It also allows users save the video to watch offline. The amount earned by YouTube Red is calculated based on how much time members spend watching your content compared to other content. Working with brands: - Ad agencies and brands are always looking for ways to promote their products. If your subscriber’s choice is similar to their product, then brands can be eager to work with you. Crowdfunding: - When a community of fans contributes money to your project, it is known as crowdfunding. You can launch an external crowdfunded campaign to promote this. Events: - Schedule live appearances in the places where your audiences are most engaged and enthusiastic. So how much does a YouTuber make a year? There is no answer to this question as it varies. Some may earn Rs 16,2700 while others income may be less than Rs 1000. YouTubers make money from advertisements which are sold on an auction basis. The highest bidder gets the best spot for his ads. The money one earns on YouTube depends on some monetized views they get on their videos per month. Monetizing pays in CPM (Cost Per Mille) which varies from Rs 66 to Rs 460 per CPM. Hence no exact amount can be guaranteed to earn through YouTube.